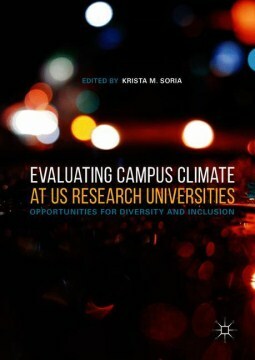 This book examines campus climate data collected from undergraduates at several large, public research universities across the nation to enhance understanding of the long-term impact of campus climate on student success. Many universities have refocused their attention and energy on campus climate, defined in this volume as students’ perceptions of how welcoming and respectful their campus environments are for students from different social identities. As structural diversity continues to grow more complex on college campuses around the nation, campus leaders have begun to take more steps to understand campus climate and address persistent inequalities, acts of discrimination, and violence against students from diverse backgrounds. The authors in this volume address initiatives to improve campus climate and provide empirical evidence on the effectiveness of those programs.